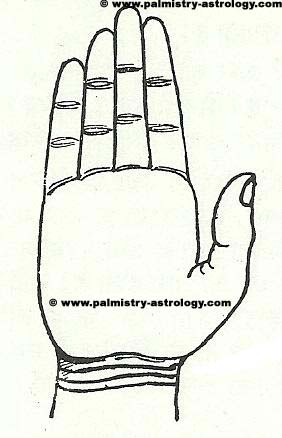 Wrist lines or Bracelet lines or Rascette lines are located at the base of palm. These are horizontal lines on the wrist, which appears when palm is bent towards wrist. These wrist lines gives idea about health, wealth and age of the person. There can be one, two, three or four lines on the wrist. Having three lines on wrist is considered best. If there is only one clear line on wrist, it indicates that the age of the person will be between 23-28 years. If there are two clear lines on wrist, it indicates that the age of the person will be between 46-56 years. If there are three clear lines on wrist, it indicates that the age of the person will be between 84-100 years. If there are three unclear lines on wrist, it indicates that the person is improvident. If there are three lines on wrist in which first is thick, second is thin and third is small, it is the indication of prosperity in the childhood, decline in mid-age and again prosperity in old-age. If there is a ‘star’ like sign on any line of wrist, it is the indication of good health. If there is ‘hook’ like sign on wrist, it is the indication that the person will get ruling power. Tagged bracelet lines, hook like sign on wrist, line on bracelet, prediction of age through wrist lines rascette lines, star sign on wrist lines, wrist lines, wrist lines and logevity. Bookmark the permalink.